Upgrading a scoreboard has always meant added value to an athletics program, but never really benefited other students or groups in a school. With the introduction of ScoreVision’s innovative jumbotron scoreboard system, this is changing at schools across the country. ScoreVision jumbotron systems bridge the gap between academics and athletics by providing a platform that introduces unique opportunities to engage students interested in marketing, design, broadcasting, computer science, business, and other areas. 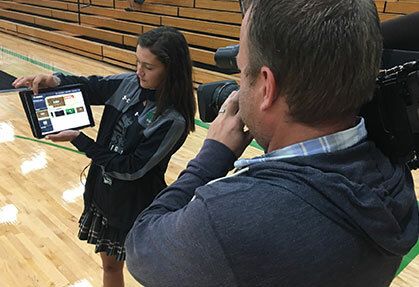 Upgrading to ScoreVision gives your students the opportunity to learn real-world career skills and a platform to showcase their work throughout games and other events on ScoreVision’s multimedia displays. 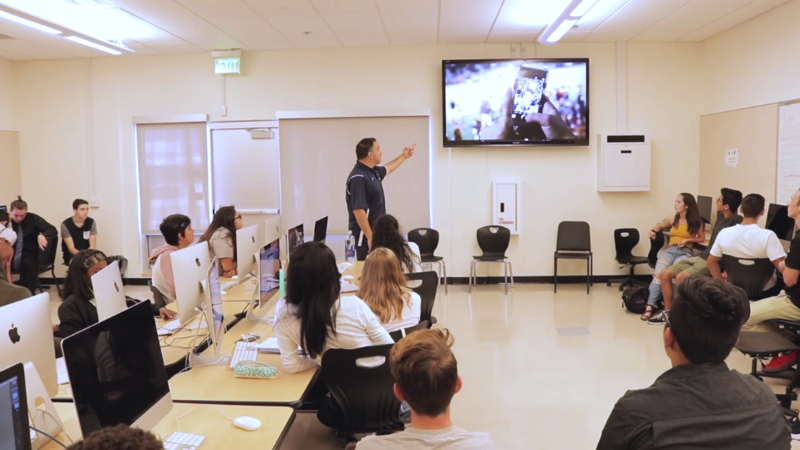 The ScoreVision system not only replaces scoreboard functionality – its benefits reach throughout the classroom and community. Hear from ScoreVision customers who are enhancing educational opportunities at their school with ScoreVision in the short video below, then explore some of the ways ScoreVision enhances education for students in several areas of interest including marketing, business, design, technology/computer science, and broadcasting. Students can get involved by working with local businesses to create messaging, sell advertisements, and brainstorm sponsorship options. Students can also learn valuable event production skills by planning and executing sponsored events such as themed basketball games. Students can learn about finance and business planning by creating strategies around selling sponsorship opportunities. These can be based on objectives such as the revenue goals needed to support various programs and projects. Design students can learn and practice industry-standard graphic design techniques by creating collateral for advertisements and designs for events like graduation ceremonies, pep rallies, banquets, and other communications. Computer science students can work with the ScoreVision software and hardware systems to facilitate event production. There are many opportunities for broadcasting and A/V students to get involved with a ScoreVision system. Students can coordinate and direct jumbotron productions during games and events while gaining experience managing video, graphics, sound, camera feeds, and more. ScoreVision is proud to help equip students with valuable career skills through our jumbotron display systems. The benefits of upgrading your scoreboard no longer extend only to your athletic program – now they can unite students across your entire school. Hear from schools who are using ScoreVision to bridge the gap between athletics and academics here and here and follow us on Twitter, Facebook, and our e-newsletter to be the first to know when new content is released. Want to bring the educational benefits of ScoreVision to your school? Contact us today!